If there were ever a company that deserves every ounce of praise it ever received within the horror community, it would be Anchor Bay Entertainment (known prior to this as Video Treasures). In fact, it wouldn't be outlandish to venture a guess that without them, the entire landscape of home video horror would not only be much bleaker terrain, but many of the fans who converge on message boards, blogs and other social networking outlets would never have been brought together to celebrate the films we all know and love. For years, horror lingered on the underbelly of the film world and many fans were flabbergasted to find out the overwhelming amount of literal classics they was missing out on. Anchor Bay did all the right things at the right times; the stars aligned perfectly for most every horror fan at every turn. They were a large enough company to get past the fringe of being merely niche and they possessed the ability to get their products in stores everywhere. Imagine never being able to see films like Zombie or Tenebre and the surprise when ventures into local Wal-marts, grocery stores and music stores led to easily finding these abandoned treasures at prices even budding pre-teen fans could afford with a meager allowance. Cheaper still were certain videos released by HGV, who were Anchor Bay's distributor in Canada. Whereas typical early, higher quality widescreen clamshell releases on VHS (titles like Demons 1 & 2 or Phenomena were still released under the familiar Anchor Bay label) were $9.99 in Canada, it wasn't difficult at all to find full frame HGV distributed tapes of Prom Night, The Evil Dead and Maximum Overdrive at the prices of $4.88 - $7.88 until HGV officially became Anchor Bay Canada in 2002. At these prices, quality collections could be built fast. 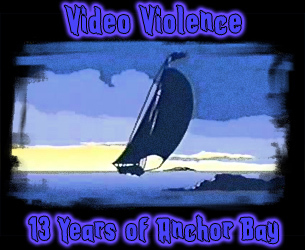 These were many fan's first excursions into the hobby that would soon lead into a much bigger obsession with a hell of a lot more resolution in the form of DVD, where Anchor Bay left their mark like no other company before it. From Academy to Wizard and everything in between, Anchor Bay blew them all out of the water. The first official DVD release from Anchor Bay came on October 28, 1997 in the form of the perennial slasher favorite, Halloween and their first digital disc wasn't good at all. But it was a legitimate horror classic from John Carpenter to test out the new DVD player and more releases would soon follow, culminating is the best official release in 1999 featuring both the original and TV cuts alongside Dean Cundey's prototypical cinematography in its proper color timing. Mild outrage would erupt from time to time when the blue tones were lightened up on certain future releases, but other than way too many re-releases on certain films, it'd be one of the few stumbles on the AB road. If the archetype slasher wasn't enough, Anchor Bay also brought forth the re-release of all three (at the time) George Romero zombie films, including a much maligned 30th anniversary edition of Night of the Living Dead which inserted newly shot scenes into the fan favorite, changing the tone and effect of the film considerably. The pros were few to most fans, but a new female zombie showing off a missing limb in stunning black and white made the film feel ever so slightly grotesque. The fact of the matter remained that there was no use messing with a classic, but it still proved to be an interesting example of testing the waters for the home video market by trying to add to the film what Romero would have liked to have back in '68 had he had a bigger budget. One of the undisputed kings of the horror film, Dawn of the Dead was released in multiple versions with a trippy, bright neon cover featured on the 139 minute cut that while not Romero's preferred theatrical version (running at 127 minutes), was still an excellent way to get everything out of the film a fan possibly could as poor pacing still wasn't an issue at nearly two and a half hours. It just goes to show that while a bad movie can never end soon enough, one never wants a great one to ever end. The gory Day of the Dead would continue the popular social commentary-based storylines Romero fans expected in a much more apocalyptic, dark episode in the series. Eventually released in a two disc edition, there was slight controversy in the fact that parts of the film's audio track seemed to stem from TV prints that censored certain words. While purists scoffed, most decided that with a great transfer and a 5.1 audio track, this minor complaint could be seen as mere water under the bridge. A few years would pass and finally Anchor Bay would release the elusive Zombi cut of Dawn, supervised by Italian horror maestro Dario Argento. Unfortunately for the curious, Argento's attempt at making the film more European failed. The creme de la creme would be the huge four disc box set featuring nearly everything under the sun pertaining to Romero's flagship title. The Evil Dead trilogy proved to be one of Anchor Bay's biggest successes, releasing the first two over-the-top films a multitude of times before eventually peaking with their releases packed inside a replica of the film's Necronomicon. Sam Raimi's films never looked better and the gory violence was never more enjoyable than with DTS sound and widescreen versions of the latter two films. Debate has reared its head on the aspect ratio of the original film, but certain releases did include both versions for the nitpicky fan. Army of Darkness came a little later on after a stint on Universal DVD and saw a few releases over the years, but none as great as the popular and out of print 'Boomstick Edition' which included the well loved, fast paced theatrical cut and the alternate director's cut, which proved to be a much more serious film in spots and had a downbeat ending in replace of the infamous S-Mart showdown. With entertaining Bruce Campbell & co. Commentaries on all releases, this holy trilogy of demonic excess proved to be the most entertaining discs of all time for the genre fan. Not surprisingly, a bulk of the early offerings were these sort of well known titles; however, the company wasn’t afraid to take a few risks to bring home some smaller titles during this time. Among one of the earliest releases of this type was the Canadian slasher favorite, Prom Night. While the title itself is obviously notable, this release later gained some notoriety because it soon went out of print, leaving many fans unable to see Jamie Lee Curtis’s unfortunate encounter with yet another slashing psychopath. Also, while remakes have been all the rage lately, but it seems like many fans have forgotten their place throughout horror history. Even the great Werner Herzog himself wasn’t immune to it, as he set out to re-interpret his home country’s most famous horror title, Nosferatu, which first hit DVD in 1999. Once again teamed up with long-time collaborator Klaus Kinski in the title role, Herzog produced a worthy remake to the heralded original by blending modern techniques with an interesting visual style that attempted to recapture the look of Murnau’s film. Alice, Sweet, Alice, The Johnsons, The Car and I Saw What You Did also were released at this time, setting the trend of films you were shocked to see turned up on DVD. Even the public domain pool wasn’t left untouched, as a definitive DVD release of the Vincent Price vehicle, The Bat, flew its way onto store shelves. Other films like Daughters of Darkness, The Blood Spattered Bride, Anguish, Cannibal Man, and Autopsy provided some unique flavoring to any horror fan looking to go beyond the standard classics they’d been familiar with for so long.